Shortly after the last episode of my New Moon Blog (recounted in The Revenge of the Bee Goddess), on the day AFTER The Day My Life Changed Forever, I unintentionally channeled the magic of Scheherazade and Tinker Bell. Scheherazade used the power of storytelling to prolong her life by telling 1001 tales, but I used it to help me end my old life and begin a new one. As I told the story of the end of my marriage that day (not quite 1001 times) to help it become more real to me, I also gathered pixie dust/pollen/love from each listener. I later used this sweet magic to create honey out of what could have been a bitter ending. On the day after the woman who was to become my husband's new wife came to our home and told the truth I had been trying not to believe, I called everyone in my phone book and was on the phone all day. All of my support network had heard the chapters of my previous decades before. Dramatic upheavals and bumpy transitions: challenging childhood, teen rebellion, roaring 20s, catastrophic 30s, and finally the husband-centric domesticity of my 40s. Now, what seemed the latest (and perhaps most predictable) chapter: separation, loss, and displacement at 50. Yet, as in Scheherazade’s tales, the telling was life affirming. And, like Aladdin, my stories conjured a genie. For each recounting caressed the lamp and slowly the genie within awakened. I was still in shock, so I did not realize it until weeks later, but by the end of that day, my lamp had broken open and the pieces lay intermingled with the shards of my shattered heart. 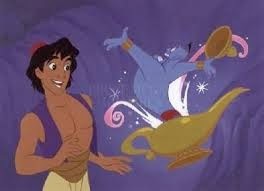 It would take a while for my genie to begin to come into her power, but the process was now irrevocable. The other magic from those calls on "the day after" was that I asked each person to help me through the time ahead by holding me in their thoughts/prayers or sending good juju--whatever worked for them. Whether or not they did, I BELIEVED that they were all cradling me in a very different kind of container than the one that was breaking. I FELT their love and support like pixie dust preparing me to take flight. From this point on, I was able to address the logistical issues of ending my old life and creating a new one with strength, grace and wisdom that astounded me - and my loved ones. Far from perfect, but a miraculous shift from what was previously possible. No one could have created this transformation for me but I could not have done it alone. And none of it would have been possible without all of those broken pieces at the end of all of those chapters of my story. I invite you to consider one place in your life where you could use some support. Whether it’s from a friend, a coach, or some other source, I encourage you to gather that pixie dust and tell the most empowering story that you can. If I could do this (truly nothing short of miraculous, given my history!) so can you. Next months New Moon adventure will take place in Never Never Land. See you there or hopefully sooner in the comment section below. You were one of my greatest supporters after I called you that day, Mom. Thank you for all you did to help me through that time!